Arthritis of the elbow is a common cause of pain in the area. The elbow consists of three bones; radius, ulna and humerus. There are joints that occur between each of these three bones. Arthritis is a disease of these types of joints. 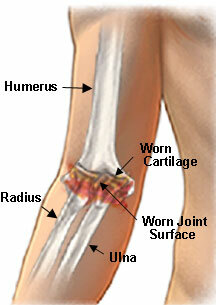 Osteoarthritis and rheumatoid arthritis are two common causes of arthritis of the elbow. Osteoarthritis occurs when the smooth lining of joints is eroded, causing the bones to rub against each other. Rheumatoid arthritis is an inflammatory autoimmune disease causing destruction of the joint lining as well. Coexisting tendinitis and bursitis may confuse the diagnosis. Patients will have a decrease in joint mobility and flexibility, causing difficulty with everyday tasks. Muscle wasting may also occur. The pain of arthritis of the elbow is located in and around the joint. It is worse with motion and relieved with rest. Plain X-rays are useful to exclude other problems, such as fractures, which may also cause pain. The treatment of arthritis of the elbow begins with conservative modalities. These include heat, ice, rest, physical therapy and non-steroidal anti-inflammatory medications. Injection into the joint of a solution of a local anesthetic and a steroid may decrease pain and facilitate physical therapy. Surgical treatment is reserved for the most severe cases.